Every customer’s problem is different, but their needs are consistent: they call us when they need someone to act swiftly to provide real, long-term solutions or to help with a crisis. We dig deeper. We wouldn’t be doing our job if we simply put a Band-Aid on the current malfunction. That’s why we find the root cause of the trouble and help solve it, keeping you from reliving the same error again and again. The Subsea Company offers innovative solutions to your most difficult, time-consuming malfunctions. Our mission and values are aligned with yours – working to preemptively avoid downtime and doing what it takes to find solutions that work. 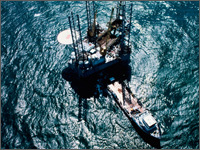 The Subsea Company has significant experience in operating deep-water rigs. We are operationally-minded and we not only listen to what our customer’s needs are, we have the background to actually relate to them. Our values and vision are aligned with your operational needs because our top level management has a similar background to your front line managers and operations personnel. We know the importance of having a reliable subsea system. That is why The Subsea Company specializes in creating products that are reliable and that proactively work to prevent failures and malfunctions. We design our equipment to be reliable, versatile to meet your needs with ease in operational use and maintenance.